After unanimous first readings, Knesset officially paves the way for March elections, passes third version of Infiltrator Law. 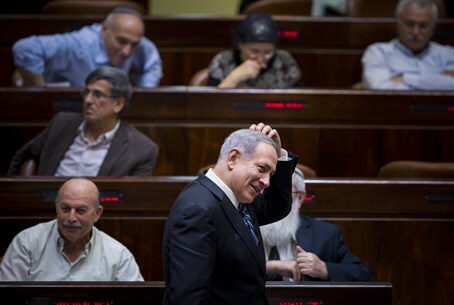 The Knesset on Monday evening officially voted unanimously 93:0 to dissolve itself, disbanding the 19th Knesset and preparing the way for elections on the 20th Knesset to be held on March 17. The vote was approved by the Knesset's House Committee earlier in the day, and comes after the bill to disband was unanimously approved in a preliminary vote last week. Now that the end of the Knesset is official, election campaigning is set to be kicked off in full swing. Knesset Speaker MK Yuli Edelstein (Likud) remarked during the vote "in a reality in which legitimate differences of opinion turn into abysmal arguments; when differences in viewpoints turn into personal loathing and lead to score-settling which locks up all initiatives and all possibility of cooperation within the coalition - the government turns into an empty body, lacking effectiveness in which all sides are busy with the weakness of the other." Prime Minister Binyamin Netanyahu dismissed key coalition members and ministers Tzipi Livni (Hatnua) and Yair Lapid (Yesh Atid) last Tuesday, accusing the two of a "putsch" attempt in trying to replace him with an alternate government from within the coalition. Ahead of the vote, Lapid said in the Knesset that Netanyahu made two mistakes: "he took Israel to elections which will not serve the public, and the second mistake: that he will lose." Far-left Meretz party chairperson MK Zehava Galon said "how much bad this government did, and how good it is to see it going home." Last minute shuffling to reach an alternate coalition with the hareidi parties so as to avoid elections fell through, leading to the Monday vote and the official collapse of the government. In the same Monday session before dissolving itself the Knesset also ruled to pass a watered down Infiltrator Law, which makes the third iteration of the law after the High Court struck down two previous constructions of it. The law passed second and third readings, sealing it into Israeli law with 47 MKs for and 23 MKs against. Far-left activists present at the vote vowed to petition the new law in the High Court. The bill passed an initial vote last Sunday. According to it, illegal infiltrators can be held for three months in the Saharonim closed facility, then transferred to the open Holot facility to be held for up to 20 further months. Connecting the two votes on Monday, Yonatan Yakubovich, head of the NGO Israeli Immigration Policy Center's publicity department, explained previously to Arutz Sheva that upcoming elections may harm the law and mean the release of illegal infiltrators, in that the government may not be able to oppose High Court complications to it. While leftist organizations have claimed the infiltrators are refugees, figures presented by the state have shown the overwhelming majority of them are not refugees, but rather work migrants breaking the law in a search of greater job opportunities. That assessment was confirmed last month in a report by the Danish Immigration Service (UDL), which found Eritrean migrants are not refugees. Tel Aviv police last Friday held a major sting operation closing 30 illegal bars that served as crime dens to infiltrators in southern Tel Aviv, near the Old Central Bus Station. The issue of the tens of thousands of illegal infiltrators is a serious one, particularly in southern Tel Aviv where residents are exposed to endless crime, with many Jewish residents saying they are terrified of leaving their homes and begging the government to take action. Crime rates dropped dramatically in the area after the Holot detention facility was implemented.